I have been planning to come back and try this ever since my last visit to Sudestada and have had the chance to read up on it ahead of time. This is Equipo Navazos in their element. As their excellent (as always) ficha points out, this is really a historic artefact, an example of the “colour” wine that used to be added to wine to – I think you can guess – give it colour and aromatic complexity. 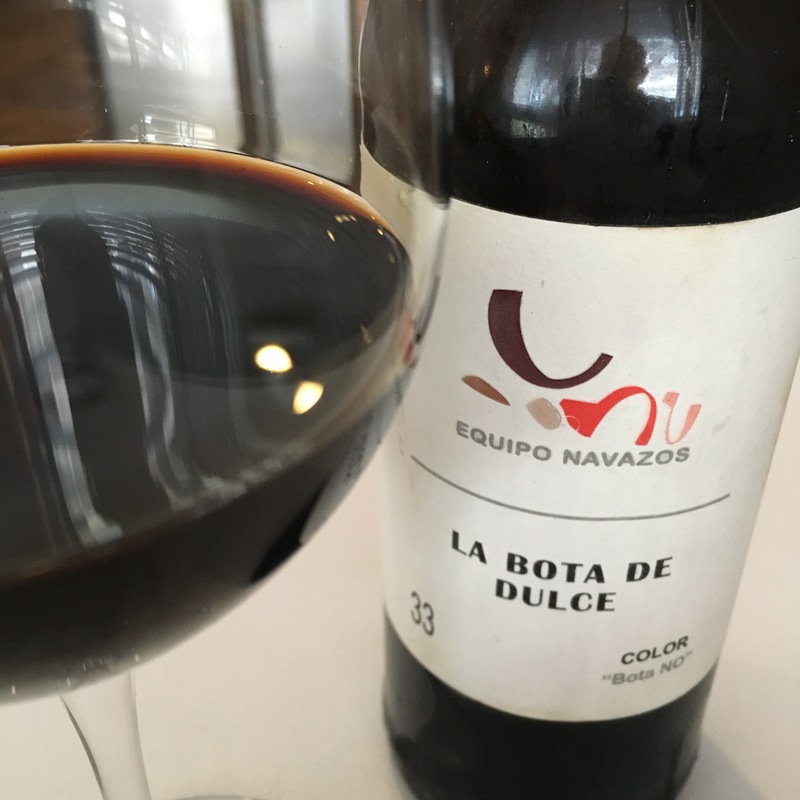 I recommend reading the ficha for all the details but this is a wine of about 80 years old that was obtained from the cellar of almacenista Juan Garcia Jarana (a happy hunting ground for these guys). The “color” in question is black with a reddish brown edge to it, and the tear on the glass is that red brown. On the nose it is surprisingly quiet – I expected my eyes to water – but while all that aromatic there is a nose of distilled barrel with some eucalyptus. On the palate again it is nowhere near as acidic or potent as I expected. (In all seriousness I wonder if it might have lost some of its mojo after a long time open, but then again for an 80 year old wine it isn’t exactly delicate.) Neither does it come across as sweet – despite the 190 grammes of sugar per liter it apparently has. In fact on the whole I find it balanced, tending to bitter. The bitterness and the barrel flavours are dominant – just a little woody spice, tobacco and resin at the end, and it isn’t really astringent either. Sticky length – one word I notice I haven’t used is salinity, and this is a finish that sticks to you rather than making the mouth water.